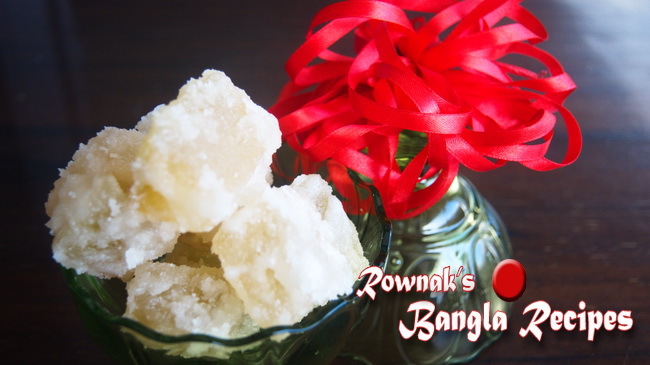 Chal Kumrar Morobba / Ash Gourd Candy is a translucent, almost clear candy prepared from mature ash gourd. Ash gourd is also known as winter melon Or Chal Kumra in Bangladesh. Just make it sure you are using mature ash gourd to get perfect ash gourd. You can have it as a snack or make cake or Jorda (Sweet Rice) with it. 1. Peel skin of ash gourd, cut and remove seeds and soft part middle part. 2. Cut into pieces of desired size and wash it. 3. Prick all pieces with a fork. 4. Dissolve Quick Lime in 1.5 litre water and soak Ash gourd pieces for about 4 hours. 5. Remove Ash gourd pieces from Quick Lime water, wash thoroughly and place into strainer. 6. 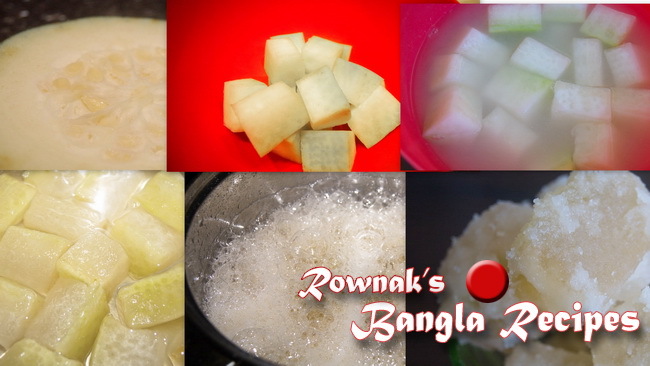 Boil water in sauce pan and when water comes to boiling point, add gourd pieces; cook it for 10 minutes. 7. Remove from heat, drain thoroughly and pat dry it (we don’t need any excess water) . 8. Combine sugar with 2 cups of water and cinnamon stick; heat till sugar dissolves. 9. 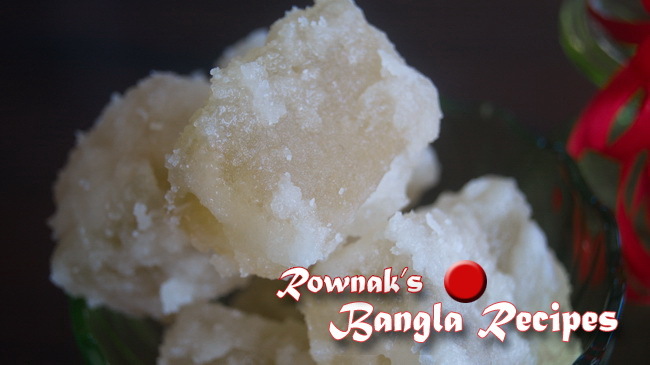 Add boiled gourd and cook till gourd get softened and sugar syrup starts crystallizing. 10. Remove from heat; remove the pieces on aluminium foil or plastic paper from sugar syrup and keep the pieces separately, so that they do not stick to each other; If sugar does not crystallize on ash gourd, you can add in it in syrup again. Let it cool down. 11. Enjoy Chal Kumrar Morobba / Ash Gourd Candy. Chal Kumar moron a came out perfect, where should I store it? In the freeze or in the cupboard, how long they will last if I don’t freeze it? By the way I didn’t receive any new recepi from you for a while, please put me back in your mailing list. Love you, stay well. Hi Tanjila! Great to know that your morobba comes out perfect. You can keep it cupboard about 3-4 months but i prefer to store in refrigerator which will extend shelf to year. Sorry i can not you to my email list, you have to do by yourself to go my website. Sorry for my absence and thanks for noticing that. I am having a hard time with the loss of my Dad. Hope my readers’ love and Allah Almighty will give me strength to bear this unbearable pain. Please keep me in your prayer. Thanks.